Yes, there really was such a time! During that period, when an airworthy used airplane could be purchased for the price of a used car, the author bought a Piper Cub (J-3 model) and then learned to fly. He proceeded to own ten different airplanes and have quite a number of lively aerial experiences. He has penned a collection of stories drawn from his aerial adventures (and misadventures) describing the ex­hilaration of flying free with the birds in one’s very own airplane, plus the perils of sometimes pushing the risk envelope (regarding the plane’s and the pilot’s limits) a bit too far. The age-old adage, “Good judgment comes from experience...and experience comes from bad judgment” applies in spades to some of these stories! 38 Short Stories of Flying Adventure! 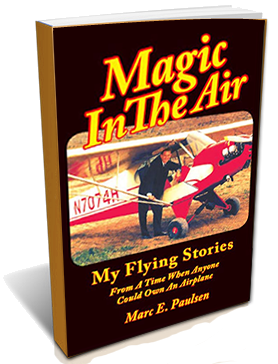 MAGIC IN THE AIR by Marc Paulsen is written with energy generated by his love of not only flight but also his aircraft. It is truly a frolic through a series of experiences in which he analyzes his mishaps as well as the physics of flight. Marc’s collection of stories could be reminiscent of a good old hangar session with pilot buddies discussing “Those Magnificent Men and Their Flying Machines”…with a modern twist. The novice pilot may gain some vicarious experience reading Marc’s exploits and introspection of his decisions. 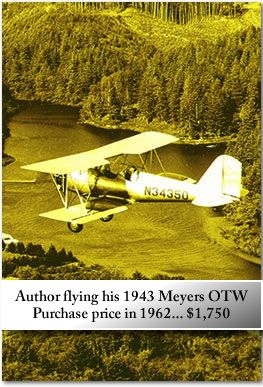 It was especially interesting to me as Marc learned to fly at my father’s airfield, built my fireplace at our farm and daringly delivered his Meyers OTW to Dad’s field. The book is good reading, humorous and inspiring. Makes you want to dust off the Cub and go flying.